With an Origins Award-winning game already on the market, Proving Ground Games is getting ready to branch out with a Kickstarter campaign for a more traditional board game. Heather Brown, business manager and game designer for Proving Ground, was kind enough to give us a few moments to talk about 1740, and the launch of their Kickstarter campaign. So 1740 appears to be a pretty wide change of direction for the company that just won the award for Best Historical Minis game at Origins. What’s the thought process behind 1740 and how did become the “next game out the door” for you guys? 1740 has been in the back of my head for years. We went with Fields of Fire first because we had a well-tested set of beta rules from the 90s that just needed updating and tweaking. Books are less expensive and easier to publish, so we wanted our first foray into game production to be something that we knew we could get off the ground. Now that we have that experience behind us, we’re poised to launch additional projects with a much better handle on the process. 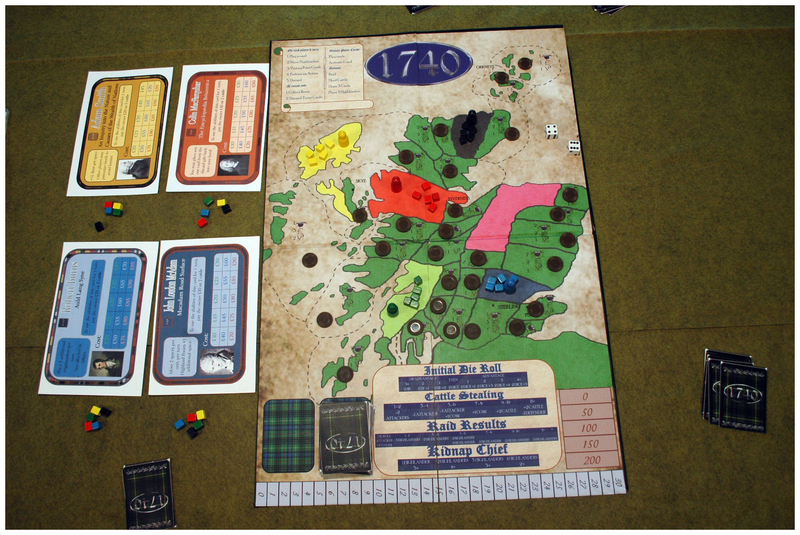 1740 is a departure from Fields of Fire, but it still falls within our core game development philosophy. 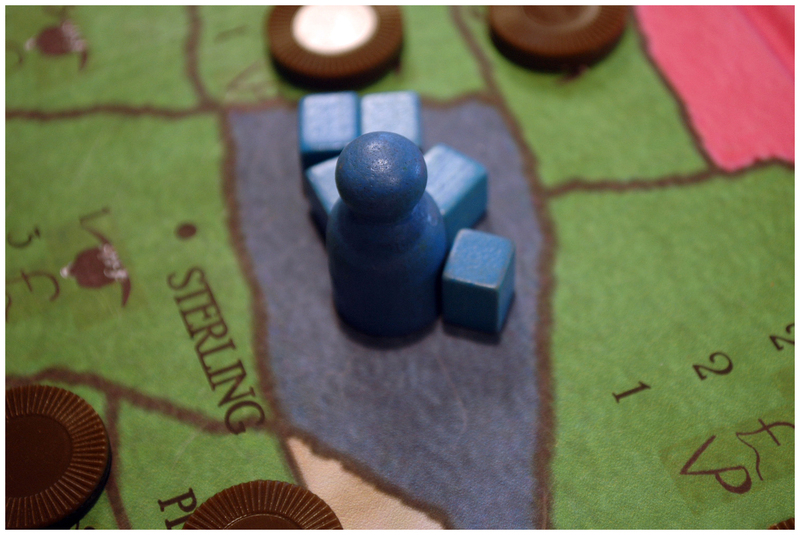 Our mission statement, if you will, is to produce games that are historical, accurate, fun to play, and easy to learn. 1740 fits that to a tee. As far as why 1740 and not something else? I’ve loved 18th Century history since I was a girl. I grew up reenacting and actually my husband Mark and I met at a reenactment. One of my favorite books in high school was Outlander. It’s the story of a woman from 1945 being thrust back into Scotland in the 18th C. That kind of thing resonates with a reenactor. When I met Mark, he was portraying a Scottish loyalist regiment in the Revolution. So, 1740 brings together a lot of my passions into one place. Give the audience the ‘elevator pitch’ for 1740. Why is this a game that strategy gamers in general, and wargamers in particular, should be picking up? When I designed 1740, my goal was to not only capture the feudal nature of the Scottish Highlands, but also come up with a board game combat system that replicates both cattle lifting (stealing cattle being the second oldest profession in the Highlands) and inter-clan combat with ease. It’s an area control game where no one can walk across the board with impunity, and you get to kidnap your friends, hold them for ransom, make and break alliances, haggle, and generally cause mayhem. How would you describe the mechanics of the game? The game is a hybrid between the “ameri-trash” systems and Eurogames. There are area control, economy, resource allocation, and dice-based combat. 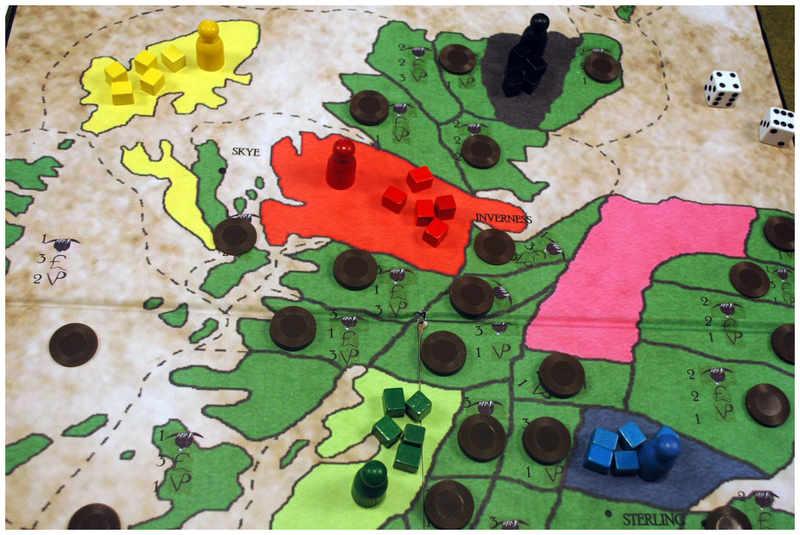 Each player controls a Clan Chief, the highlanders of the clan, cards that can be played to influence the way the game moves, a number of cattle, and a cash reserve. In the game, there are three types of cards: event cards, victory point cards, and standard cards. Event cards include things like famines and shipwrecks, that effect all players at the end of the game round. Victory point cards represent famous people, places, and things from Scottish history. Depending on which cards a player controls, game play can change dramatically. 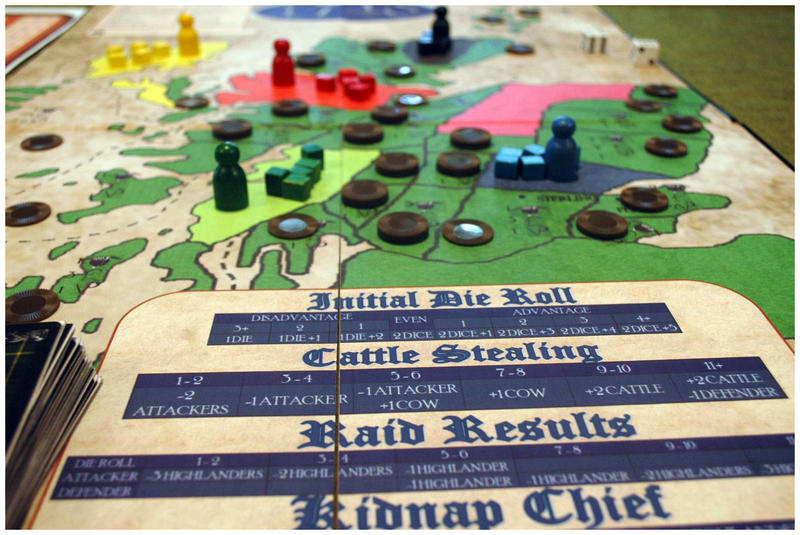 For example, the Rob Roy card allows a player to steal all cattle from one board space. This is a pretty powerful ability and just having Rob Roy in play can change player strategy, even if he’s never used. Finally, there are the standard cards. They provide temporary boosts or debuffs to player abilities. Increased movement, combat bonuses, forced alliances, and royal protection are some of the game effects standard cards can have. Each clan starting area is roughly analogous to the area controlled by a major highland clan. They are separated by areas occupied by minor clans that can be allied to the player clans. 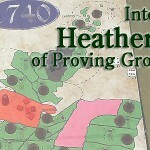 By moving Highlanders into each area, players control those areas and the clans inhabiting them ally with the player. This allows the player to collect rents from the tenant farmers and gain control of any cattle in the area. The available resources are asynchronous, meaning that each clan has different levels of available resources. Also, while each clan is fairly close to its neighbors, some have better defensive positions than others. Each of these factors is integrated to maintain game balance. Combat is designed so that in nearly every circumstance, a player has a chance (even if small) of success and failure. The primary factor in successful combat is numerical advantage. The greater the advantage, the greater the chance of success. Combat rolls are unopposed, so you are simply rolling and checking the result against the table provided. What are some comparisons to more popular current games that readers might recognize to help them make a decision on 1740? If you like _____ then you’re going to love 1740. The first comparison I always hear is to Risk. 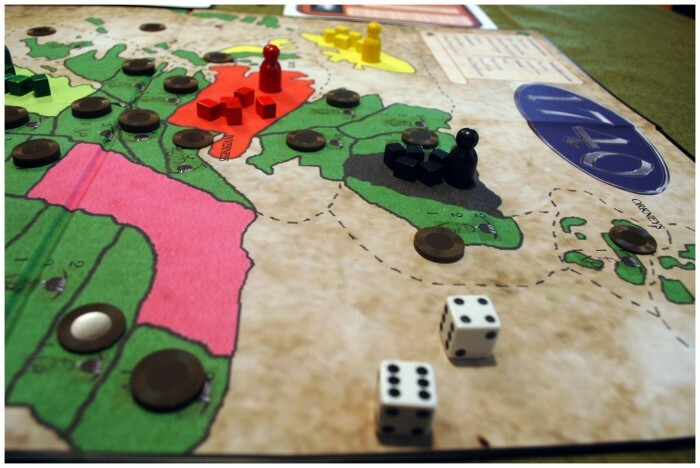 Of course, that might be because I used Risk pieces in beta testing. I also used Clue pawns and no one draws that parallel, though. It is an area control game, though, so there are some similarities. The cards add an additional level of strategy and the game is designed so that no player can walk across the board with the right die rolls, though. So, it fixes some of the weaknesses of Risk. The ability to trade cards is a little reminiscent of Catan, and there are some economy game elements in the expansion, where you can patronize members of the Scottish Enlightenment in order to gain in-game bonuses. While we all know the number of unique game mechanics are limited, 1740 puts them together in some unique ways that really aren’t out in the hobby yet. What is the artwork going to remind us of? What’s the visual style you’re aiming for? When we were deciding on the art, we had a few criteria. It had to be highly visually interesting, it had to have a historical feel, and it had to be unique. We also wanted something bold. If you look at ancient Celtic art, there is a strong use of color, so we wanted to replicate that as well. What we decided on is a pen-and-ink drawing style with bold colors. It’s a little reminiscent of stained glass, a little reminiscent of manuscript illumination. Some of the skyscapes on the cards are positively breathtaking. No sheep?! Man, I’m feeling ripped off already. Everybody asks me that. How can you make a Scottish game with no sheep?! Well, 1740 is set in the twilight of Highland culture. By 1746, the Risings were over and the Jacobites defeated. In addition to the laws passed in the wake of the ’45, land enclosures made it to the Highlands. Enclosure is a process by which property is brought out of the manorial land-holding system of feudal times and owned in a more modern way. It had been happening in England for hundreds of years, but the remoteness of the Highlands and the Clan system insulated the area from this process. After the ’45, the clans were broken and the relationship between Laird and cottar changed. This period is known as the Highland Clearances and many Scots emigrated to North America, or moved to the cities. Prior to the ’45, cattle export was the primary source of wealth for the clans. Rents were often paid in barter rather than cash, so the Chiefs sold their beef to England in exchange for hard currency. With the breakdown of the clan system, the ravages of war, and several bad harvests, cattle production slowed to a standstill. Sheep were much better suited to the new enclosed lands and Scotland’s agricultural exports changed from beef to wool. So, Scottish sheep jokes are really only about 200 years old. Don’t despair, though! In the Scoundrels and Highwaymen expansion, we’re adding in some less historically accurate cards—including some sheep jokes. Talk to us about the Kickstarter campaign. What are we supporting, and what sorts of stretch goals are you guys looking at? What’s the timeline to have it in players’ hands? I’m a big believer in the KISS principle. For the Kickstarter campaign, there will be three main backer levels. At the $60 level, you’ll get a copy of the game. At $100, you’ll get a game signed by little ol’ me, and by our artist, Shannon Owens. At $250, you’ll get the signed game and an 8×10 print of your choice of card art. We really wanted to make this Kickstarter as simple from the fulfillment standpoint as possible. We’re promising at Dec 2014 completion date at this point. And, I say promise on purpose. We were two months overdue on our last Kickstarter, and we’re making sure that this time that won’t happen. Especially with some of the high profile Kickstarters that have been woefully off schedule or flat out never delivered. We’re cognizant that backers want results, so we’re taking an underpromise-overdeliver strategy. It’s possible that some backers may see their rewards as early as October, but wanted to build in a cushion so that people are, hopefully, pleasantly surprised. On stretch goals, we have some cool goals (at least I think they’re cool!) set up. We’re putting our funding goal at $25,000. That’ll give us enough cash to print and ship the games, with a slight cushion for contingencies. (There are ALWAYS contingencies!). After that, we’ll have stretch goals at $30,000, $40,000, $50,000 and $60,000. If we exceed my wildest expectations, I have more cool stuff to add, but this is the starting point. Stretch goal one gets every backer a copy of the Philosopher’s Expansion. This includes 4 Philosophers from the Scottish Enlightenment that players can become the patrons of, as well as counters and a separate box. The next stretch goal is the Scoundrels and Highwaymen card deck. This deck is a PG-13 expansion for 1740 that includes characters from folk songs and stories, as well as key parts of Scottish culture. It’s a great expansion for an adult game night. At $50,000, backers will receive the 3rd expansion, Scottish Mythology. This expansion includes a card deck that turns the game from history to fantasy. Sidhe, waterhorses, and unicorns are just some of the cards in this deck. The last pre-release stretch goal is a deck devoted to women in Scottish history. From European queens to female generals of the ’45, this deck highlights the contributions of women. Additionally, we have unreleased stretch goals that will be announced as we begin to unlock the publicized goals. What should we have asked you about if we knew what to ask you about? What’s the average velocity of an unladen swallow? You guys are pretty thorough! Thank you! I’m passionate about this game, and I appreciate the chance share that passion with you! We fixed them – Thanks!